The ELEVATOR NET is adjustable in height and in the angle of the target. The Target is a 30" diameter ring that rotates from a vertical position to a horizontal position and any angle in between. The 30" diameter opening of the ring challenges the QB to make precision throws. 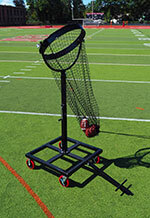 The adjustable height and the rotational options allow the QB to practice every throw in the playbook. From the short curl and stop routes to the long post and go routes to the red zone fade routes. Like nothing else, it teaches a QB to throw the high ball to a leaping receiver. Being able to adjust the target to different heights and angles allows a QB to throw the precision touch pass. The Target can be adjusted from a base of 66" to a max height of 92". An elevator jack is used to raise or lower the Target. The net is 30" in diameter by 60" long with a drawstring bottom to make it easy to retrieve the footballs. The base is mounted on 8" wheels with a pivoting tow bar so it can be hooked up to a gator and easily moved from field to field or into an Indoor Fieldhouse. "The coaching point is to make precision throws on all passing routes"